There is no need to fly a Lear jet up to Nova Scotia to see the total eclipse of the sun. It’s not there this time. I could simply drive to South Carolina. But I won’t. At 2:50:58 pm, from my very own, easy to get to, front yard here in Central Florida, 85.6 percent of the sun will be obscured by the moon. That sounds like a solid “B” to me. I will be satisfied, though a little sad, to stay home for this event. Even though I hate missing anything of this magnitude. And, the realization that just a short eight-hour ride up the road is a potential “A+” total eclipse (depending on whether the weather cooperates) might make me crazy if I let it, but I won’t. I don’t want to be a lunatic over a solar eclipse. That seems wrong. I understand that (possibly) this is a once-in-a-lifetime event – a total solar eclipse going from coast to coast. I should be more excited. I should pack a cooler and my ISO approved solar viewing glasses and go. But the thing that I keep going back to is that I can’t actually look at it. Not even a little bit. 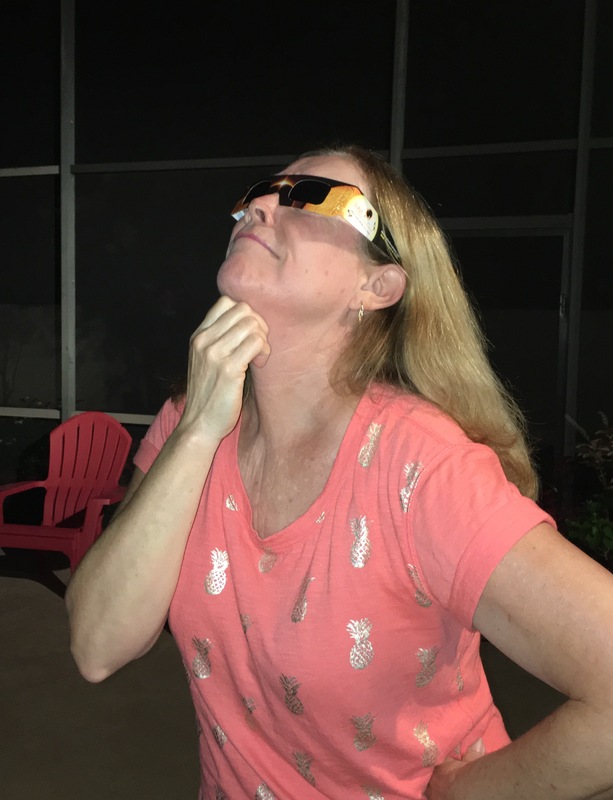 So, the thought of hurrying north to not watch the eclipse confuses my thought patterns – especially when I realize that I am very tempted to go. I want to not see the sun and experience darkness in the daytime, just like everybody else. Engineer Bob, my sweet husband, brought home a pair of the viewing glasses for me – a gift better than flowers (though not as good as jewelry). I think he knows how tempting it will be for me to look at the sun and he is looking out for me and, I might add, himself. Both of our fathers have gone blind in their old age, and Bob is hedging his bets to keep my eyesight. We look out for each other that way. We have seen the future and we want to be able to see in it. So please enjoy not watching the eclipse. It will be a memory of something that you didn’t actually see that you will enjoy for years to come.